The Pocket Films Google Maps mashup allows users to find what films are currently showing in over 850 cinemas in the UK and Ireland. The map can be navigated by entering a postcode and by clicking on the map markers. 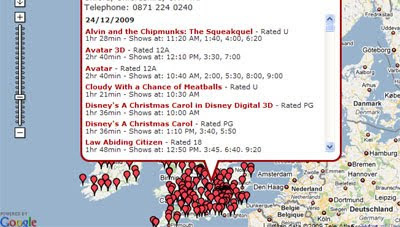 Clicking on a marker reveals the address and phone number of the cinema and film times. Pocket Films also have plans to add comprehensive digital and 3D information for the listed cinemas. The Youth Hostel association in the UK are using Google Maps to show the location of all Youth Hostels in the UK. If you click on a map marker the contact details of the hostel are listed, along with prices and the hostel's star rating. This Google Maps mashup shows the location of cafes, bars and clubs in Brighton that have a WiFi service. The locations are shown on the map with map markers and are also listed in the map sidebar. The information windows also list the passwords for many of the WiFi locations. Globrix is a real estate search engine for the UK. The site lets you search for properties for sale and rent by price, number of bedrooms and location. Each individual listed property includes a Google Map showing the property's location. 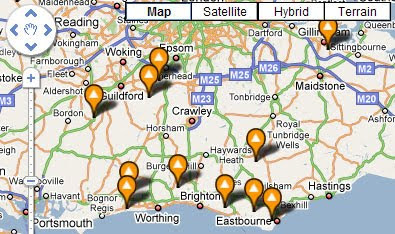 This Google Maps mashup is a marquee venue finder for the South East of the UK. The site lets you search for party tents by location. Each map marker contains contact and pricing details and a description of the location. The site also allows users to add missing marquee venues to the map. The Google Map is the largest and most comprehensive listing of telephone answering companies in the UK. Clicking on a map marker loads the details of the answering service above the map. AR + Wii + Google Maps = Cool!